FLAT BILL SNAPBACK CLOSURE. NFL SHIELD ON THE BACK. EMBROIDERED NEW ERA LOGO ON THE SIDE. HIGH CROWN. 3D EMBROIDERED LOGO ON FRONT. Stretch fit - M/L fits 7 1/4 - 7 3/4 hat size. Spot clean. Structured fit. Raised embroidered team logo at front. Flat embroidered team wordmark at back. We are more than happy to help! We include all this information as unusual situations occur. Vintage Cincinnati Bengals NFL Annco Snapback Hat Lot of 2. Condition is New. Shipped with USPS First Class Package. New with tags! 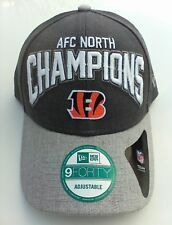 NWT 2-Tone Gray CINCINNATI BENGALS AFC NORTH CHAMPIONS NEW ERA 9FORTY HAT. - ADULT SIZE: one size fits all with adjustable velcro strap. Cincinnati Bengals New Era NFL "Frosty Trapper" Fur Lined Knit Hat. Condition is New. Shipped with USPS First Class Package. Cincinnati Bengals. Back NFL shield. Made by New Era. Left side New Era flag. Official product of NFL. Hat is a size L/XL. 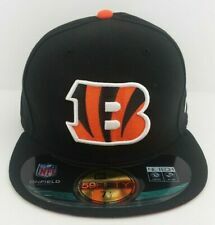 Cincinnati Bengals New Era NFL 39THIRTY Team Front Neo Flex Fit Hat M/L. Condition is New. Shipped with USPS First Class Package. CINCINNATI BENGALS BRIDGESTONE ADJUSTABLE GOLF HAT. A MUST HAVE FOR THE BENGALS FAN! Product Features: Relaxed Fit, Adjustable Back, 3D Raised Embroidery, 100% Cotton Twill. Relaxed Fit. PURCHASING MULTIPLE. The embroidered Cincinnati Bengals graphics will put your die-hard fandom on notice. 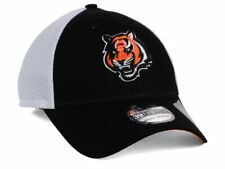 No one will mistake your enthusiastic Cincinnati Bengals pride when you don this spirited cap! TEAM:CINCINNATI BENGALS. COLOR: BLACK. SIZE: L/XL. 100% COTTON. New Era 39Thirty Flex Fit Cap/Hat size L/XL. Cincinnati Bengals team logo on Crown. Orange Bill. On Field Salute to Service Collection. 100 % Polyester. Crown: Low. Color: Orange. Primary Logo: Raised Embroidery Mascot on Front Middle. Fit: Relaxed. Bill Type: Normal. Back Logo: Flat Embroidery Wordmark on Center. Item Information. Cincinatti Bengals Orange Cap. Original Fit Snapback. 100% Wool. Adjustable Plastic Snapback Closure. Made by New Era. NONE OF THAT BOOTLEG OR FAKE NONSENSE HERE! Structured Fit, Flat Bill. We include all this information as unusual situations occur. We are more than happy to help! Size is a 7 5/8. Adjustable Plastic Snapback Closure. NONE OF THAT BOOTLEG OR FAKE NONSENSE HERE! Made by New Era. CONGRATS TO ALL THE UP AND COMING STARS OF THE NFL ! HAT SIZING. Structured Fit, Flat Bill with Ability to Curve. Nice! 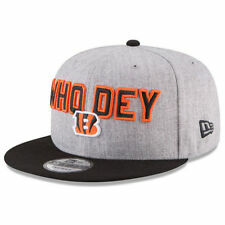 New Era 9FIFTY Cincinnati Bengals SNAPBACK Hat NFL Black ORANGE Flat Bill! This hat is very clean and odor free! Adult Snapback Adjustable. NEW ERA OFFICIAL SALUTE TO SERVICE SIDELINE FLEX FIT HAT. NFL SHIELD EMBROIDERED ON BACK. STRUCTURED FIT. 100% POLYESTER. 3D TEAM LOGO EMBROIDERED ON FRONT. Shadow Tech heather visor. Material: 100% Polyester - Crown;96% Polyester/4% Spandex - Bill. High Crown. Six panels with eyelets. Screen print graphics. Structured fit. The Trucker Washed 940 is a structured, adjustable cap with an embroidered team logo on the front panel and stitched New Era flag at wearer's left side. Made by New Era. Check-Out Now! Hat is a size 7 5/8. Hat is in blue and has a great looking bill. Bengals script is woven into the fabric. NEW ERA 39THIRTY. CINCINNATI BENGLAS. FLEX FIT HAT CAP.